FUREVER FAMILY DAY MOVED TO 15 MAY - PLEASE JOIN US THEN & SPREAD THE DATE CHANGE FOR US! Bring the entire family and join the fun on 15 May. Buy food onsite, pack a picnic basket or bring and braai. Games with Kids Core - Chett Goldin. Entering the "Miss & Mr Furever Pet Rescue" competition with Simply Models - note that parents should email Karen at karen@simplymodels.co.za to enter their child/ren (see details below on how the competition will run). Face-painting, colouring & other activities with Simply Models. Shopping at the stalls with local vendors. Interacting with some of the pups & dogs Furever Pet Rescue have up for adoption. Spending a day with familiar faces & meeting new ones. The opportunity to enter our draws & win amazing raffle prizes. Eating from vendors onsite, bringing your own picnic lunch and/or making use of the braais on site. Entrants send their name, age, photograph and proof of payment to Karen@simplymodels.co.za. Photos will be uploaded on the Miss and Mr Furever Pet Rescue Event Page. We will have a prize for the Public Choice winner that will be selected on the most facebook likes. Each entrant will need to drop of two bags of pet food on the day of the Fur Ever Pet Rescue day at Townsend Park in Ballito on 15 February between 14:00 pm and 16:00 pm. 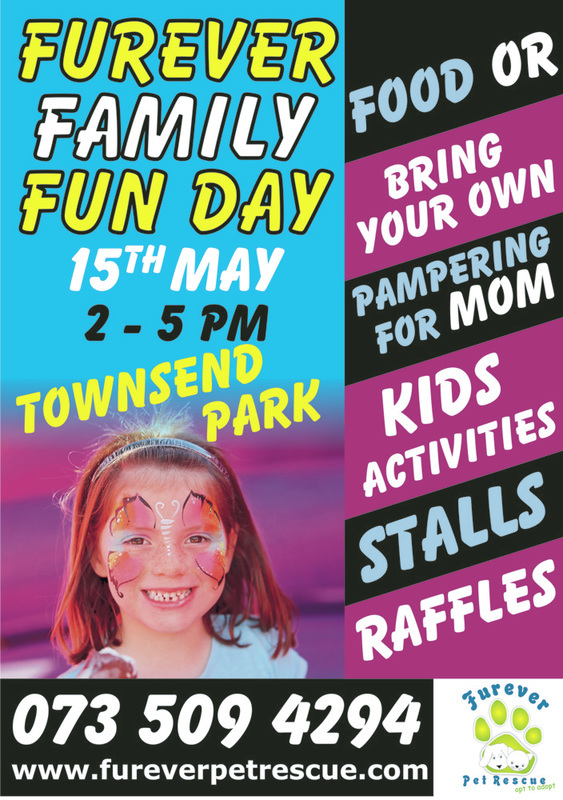 Entrants can come and have fun at this event with their families, there will be face painting, kiddies activities and even fun for the adults. It would be great if entrants can visit the face painting tent and take a photo of themselves with the lovely princesses that will be at the tent and upload that onto facebook, using the Hashtag #FUREVERPETRESCUE. Registration of entrants will close at 16:00 pm, entrants will line up and do only one walk (anyone can take part, even if this is your first time in a competition). We have three amazing judges and winners will be announced at 16:45 pm. For more information on this competition, please do not reply to this email but rather contact Karen at Simply Models directly - Karen@simplymodels.co.za.